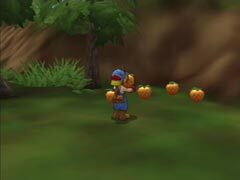 In this game there are a few items found throughout the seasons which may be picked up by the Hero and then sold for a profit, eaten for energy, or given as a gift in this game. Below is a list of the items in which you can forage, as well as their sell price, where to find them, and where to sell them at. Walnut Forest: Located around the Carpenter's House. It is the path between the Supermarket and Maple Lake areas. Maple Lake: Located past Walnut Forest in the Sunny Garden Cafe & Bar area. Harvest Goddess Lake: Located past the Maple Lake area up the hill. The Goddess Lake (or pond) is found up here. Clove's Villa: Located just past Brownie Farm. The Villa in Clove's Villa is found here. Just past Clove's Villa is Praria Forest.